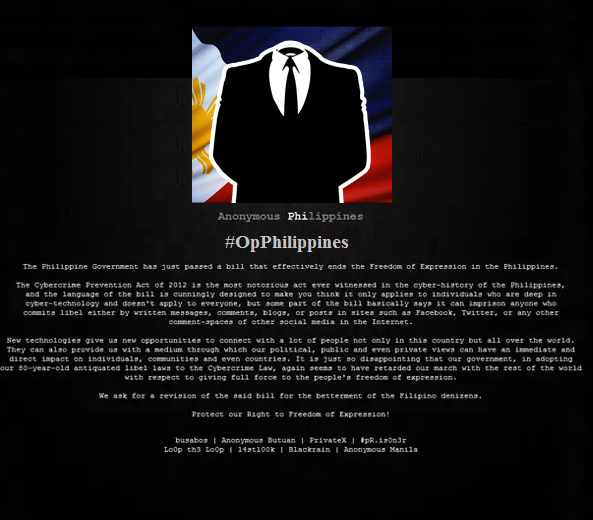 As of Wednesday midnight, the website of Bangko Sentralng Pilipinas, Metropolitan Waterworks and Sewerage System, the American Chamber of Commerce, and the Philippine Anti-Piracy Team succumbed to the cyber-attacks. The websites of the anti-smoking campaign unit of the Department of Health and think tank Institute for Development and Econometric Analysis followed suit, bringing to six the number of websites attacked. One hactivist announced the challenge to commit cyber-crime in social networking site Facebook by a user #pR.isOn3r. The post hinted in its footnote that the BSP website was a target. This attack followed by few more Govt sites and they are- National Telecommunications Commission (NTC), Philippine Information Agency (PIA) and the Food Development Center sites.